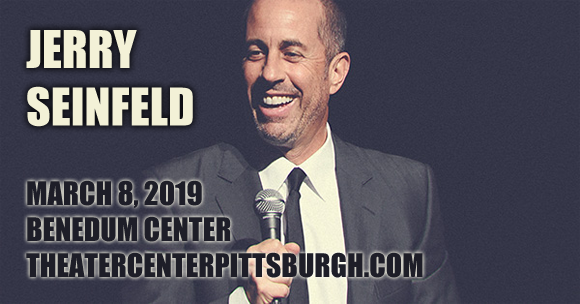 Emmy Award-winning stand-up comedian and sitcom star Jerry Seinfeld comes to Benedum Center on Friday 8th March 2019! The pithy and iconic comic is still one of the funniest men in his field, bringing fresh and zesty material to the stage with a classic wry twist! Sardonic, but full of life, Seinfeld will get you laughing until you're sore! Jerry Seinfeld is an American stand-up comedian, actor, writer, producer, and director whose career first began on the New York comedy circuit in the 1970s. After an appearance in a Rodney Dangerfield HBO special in 1976, and a small recurring role on the sitcom Benson in 1980, Seinfeld was invited to perform on The Tonight Show Starring Johnny Carson in 1981, which would change everything. From there he appeared on several talk shows throughout the 1980s, including Late Night with David Letterman. By 1987, Seinfeld had his first ever one-hour HBO comedy special, Stand-Up Confidential. Two years later, he created and co-wrote the sitcom Seinfeld with fellow comedian Larry David, in which he also starred as a fictionalized version of himself. By its fourth season, the series had become the most popular and successful sitcom on American television, and the show ran until 1998. After that, Seinfeld returned to stand-up, and in 2005 he was ranked as the "12th Greatest Stand-up Comedian of All Time" by Comedy Central. He currently hosts the web series Comedians in Cars Getting Coffee, which he also created.